This is a recently acquired band saw which appears to be pre-1943 which I plan to restore. It is reasonably complete and I have no information at all about it. I would appreciate any information anyone would be kind enough to contribute. I have this model and it is complete and working for sale. 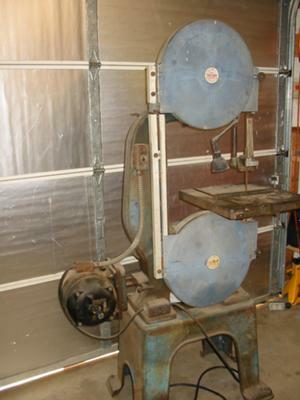 That 16" band saw was built by Walker Turner and sold as their flagship band saw for two years only, 1937 and 1938. The cast iron base you have with yours was only offered the first year from Walker Turner. Craftsman sold the same saw with only a few very minor changes from 1937 to 1940. The good news is that many of the parts remained the same on the later version of the Walker Turner 16" band saws which they produced for many years. You can find a lot of information including catalogs and pictures on the VM.org site. i should be quite easy to restore, wish i had it. Im looking for the upper shroud to this saw. Also some of the smaller parts if you are interested in selling or know of a source it would be greatly apreciated!